Chivis Martinez for Borderland Beat from Rancherita Airethank you Lacy! In Ciudad Acuña, the red code was activated after the location of a man's decapitated head in the maquila sector, behind the Caterpillar company. Although authorities have not disclosed the finding, it was learned that a human head was found on the site and a blue cartulina was left next to the grisly discovery. The cartulina message says this will happen to all of those who are with La Fuerza and Ministeriales and was signed by the CDN, Cartel del Noreste. Although authorities have not yet been able to identify the beheaded, it's a person of dark complexion, about 30 years, short hair and a mustache, with a goatee beard. At 600 meters from the head the police located a Dodge Neon car, in which there were sharp weapons including an axe, with which they decapitated the man. 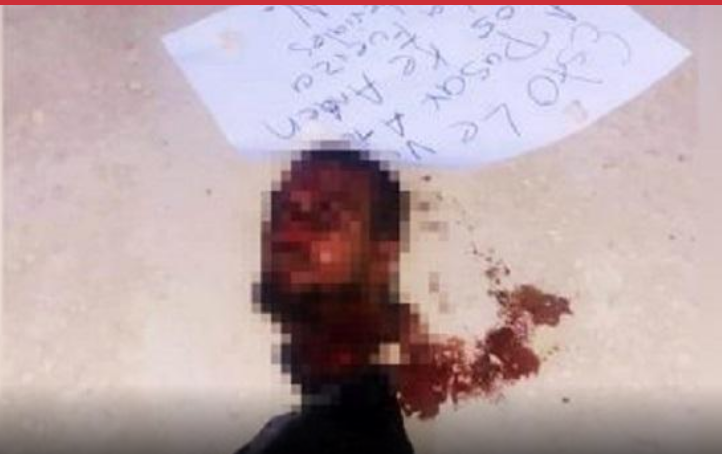 This is the second decapitated located in the North Region of Coahuila in 20 days. Chivis Note: This state is adjacent to Tamaulipas and has been largely controlled by Zetas before and after the 2010 split with CDG. It has been relatively peaceful for a few years with sporadic outbreaks of violence in some cities such as Piedras Negras. Acuña sits on the bravo Rio side of the border adjacent to Del Rio Texas. Piedras is adjacent to Eagle Pass Texas. Both are close to Allende where the Zetas massacre occurred killing hundreds, during the time of ongoing horrific violence. Does Coahuila have a particular cartel that controls it all or is it multiple cartels for example in the border area, Torreon, and Satillo? There is NOT one cartel that fully controls any state not cjng not cds not cdn not cdg not Zs...in coahuila theres blo,cds cdn,etc..
Zs absolutely controlled coahuila completely during the moreira years. However after Zs split the north still maintained by Zs CDN, with CDS in laguna area, but not as in controlling 100. Hey chivis, off topic but I would like to know what the “N” or “V” etc.. after each first name means? Before EPN you would always see the full name. What happened? Chivis is always on point!! Torreon is split between Z & CDS, id say CDS for the most part. Saltillo is split between Z/CDN & CDG. Yes, like Chivis mention all northern Coahulia is CDN. But years back northern Coahulia was control by CDJ. Z40 loved Coahulia, that was his second home. Thx, ya I remember when Calderon was president, they never used to do that. It was only when EPN came to power that it started appearing. @9:26 or anyone---I was having a discussion with a friend about who is the leadership of CDN. Maximum leader in Tamps? That would change the game in Tamaulipas. As aliances will shift. And cdg will get pushed further into a corner with no strong united cells to want to fight. Of course only if the politicos allow this to happen. Rumor has it fuerza Coahuila beat person and killed by accident and they cut off head to cover up cartel did it . did not happen. no reason to.